Dateline: June 2, 2009>>> Westminster, CO.
As we said in the EW Newsletter, we will be on assignment to the RI International Convention in Birmingham, England. However, before the convention, there is a two week tour of the British Isles sponsored by the Rotary International Travel and Hosting Fellowship. 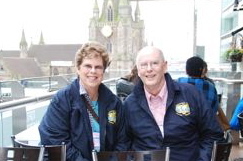 About 65 Rotarians from all over the world have signed up to attend the tour. We will be travelling by bus and boat to visit England, Scotland, and Ireland. This blog will be our meager attempt to highlight the trip and give you a little insight into what we see and hear. If you have any questions, feel free to e mail us at ldonal7880@comcast.net. We look forward to the trip and our departure on Friday, June 5th. We'll do our best to keep you informed. See you on the road. Greetings from London, England. Made a trying flight from Denver to London. Lots of turbulence, very little sleep. 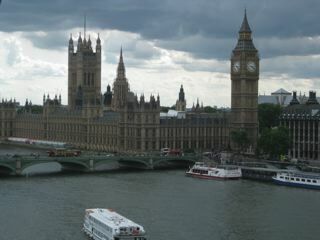 Got into London at 1 pm London time, on Saturday. Had a free afternoon to catch up. Sunday morning took a bus trip around London to see the sights. In the afternoon we watched the changing of the guard at Buckingham palace. Very impressive! 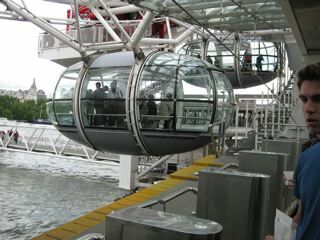 We later rode the “Eye of London” a large (300’) Ferris Wheel like structure that turns at 1 mile per hour, has 32 pods that hold 15 people each. Takes us up in the sky to oversee the city. What a view! Parliament Building with clock and Big Ben bell. We took a 40 minute boat ride on the River Thames that you see in the right hand picture. London is so accessable. The city is only 1 square mile with 32 boroughs one of which is the City of Westminster (see center pic). There are so many sights that are within walking distance from our hotel. Even had an English dinner at a close by Pub. Monday- heading out on the bus to Wales, a three hour drive West. Stopped to visit Stonehenge. Wonderful place. Smaller than expected, but still very impressive. Stopped in Bath, England to visit the city and see the old (2000 years) Roman Baths that have been excavated in the 1850’s. There is still water flowing from an undergound spring. Fortunately the weather is cooperating. Not much rain. We will spend overnight in Cardiff, Wales, and leave for Ireland by Ferry boat in the morning. A visit to the Cardiff Castle will take place early in the morning before we leave. This is all for now. We will be in touch at the next best internet connection. Yours in Rotary, Loren ( on assignment for the Award Winning EarlyWord). Our tour continues with a long day of travel from Cardiff, Wales by bus with a 3 hour drive then by Ferry Boat with another 3 hour crossing of the Irish Sea. We have a truly international Rotarian tour group. Folks are from Australia, Taiwan, Canada, USA, Japan, New Zealand, and Jamaica. Cardiff Castle, Wales Wales countryside taken from the bus. 9 Decks on this Ferry Boat used to cross the Irish sea. First sight of Irish landscape as we leave the Ferry boat. This morning we visited the Cardiff, Wales Castle built on the foundations of a early Roman fort built and distroyed nearly 2000 years ago. We left Cardiff about 11 am and drove across country West toward Ireland. We arrived in Waterford, Ireland, in time for dinner at 8 pm. Very long day. Tomorrow we will be sightseeing to Blarney and Killarney. Now it is 11:35 pm and time to turn in. What a trip! Wednesday we bussed to Cobh where, during the potato famine in the 1840's, millions of people arrived by train. From the train they made passage on ships bound for North America: Canada and Ellis Island. Between 1791 and 1853 30,000 men and 9,000 women werre sent as convicts from Cobh to Australia, sentenced for crimes ranging from petty theft to murder. The Titanic, on April 11, 1912 made its last stop here before its demise. The train station is now a museum giving is a hint of the hardships and deprivation that some of our ancestors endured. Unbelievable. Downtown Killarney Hotel Blarney Castle. Blarney Stone at the very top! Train station at Cobh where so many refugees left for North America. An avid shopper (Barb Donaldson and clerk Sheila) try on an Irish sweater. The beautiful hills and farmland on the drive around the Ring of Kerry. These are the two coaches our Rotary crew is using for travel. From there we ventured on to Blarney where we visited the Blarney Castle. Most everyone climbed the 100 or so steps to kiss the Blarney Stone. What a chore. We were able to spend about three hours in Blarney where we shopped, had ice cream and enjoyed the beautiful weather and scenery. From Blarney, we tripped on over to Killarney, where we spent the night in a very quaint hotel right in the middle of town. We can hear and see the horse drawn carriages that take tourists for rides. Today, Thursday we had a bus tour of the Ring of Kerry,a 90 mile trip, where we witnessed the beautiful scenery, some unbelievable shopping of handcrafted goods, marveled at the stunning vistas created by windswept cliffs, rugged mountains, still lakes and picturesque villages. Had a delicious lunch overlooking the bay of the Ivy Peninsula. We learned that Irish Coffee was invented in 1940 in Shannon, Ireland, to refresh air travellers from the U.S. after a long flight from New York. One store we visited even served each of us an Irish Coffee as we shopped. Tonight is a special treat: we will be attending a show here in the hotel of local talent. It is touted to be a high energy extravaganza that we will all enjoy. We will preceed that with a reception for the whole group (about 60 Rotarians) and the two Rotary Clubs here in Kellarney. Should be a wonderful evening. If you have any questions, please drop me an email at ldonal7880@comcast.net. Thursday was a very interesting day spent on a bus tour of the Ring of Kerry. This area of Ireland is on the West coast of Ireland and is actually a ring of back country roads that wind their way through some of the most beautiful country in the world. We made a stop at the Gap of Dunloe, a glacial feature that breaks up the local mountain range, to do some shopping. We then continued on, marvelling at the still lakes and picturesque villages. We ended our day returning to Killarney and doing some local shopping and sightseeing. This is a memorial to the Killarney war dead from the 1st World War. At the hotel we were able to take in a high energy show of local Irish music and dance. This is the Killarney Ave.Hotel which hosted our group in Kellarney. The welcome sign at the Dairy Paddy and Margaret Fenton with Loren in front of the farm house. William Fenton explains some of the fine points of dairy farming to Sylvia Lucas. On Friday morning we drove about an hour and stopped at a local dairy farm. The family, Margararet and Paddy Fenton and their son, William, who runs the farm now, hosted the whole group to a morning tea. It was a delightful visit with these very charming people. We had homemade scones and Guiness bread actually made from Guiness beer. Delicious! William took us on a tour of his dairy farm and said that he works this farm alone. He does hire out some of the work when it is time to harvest the grass feed for his dairy cows in the fall. After leaving the dairy farm we drove to the Rock of Cashel. This is where St.Patrick preached and, as legand has it, rid the Emerald Isle of snakes. Rock of Cashel. Once the seat of the overkings of Munster, the Rock first became a fortress in the 4th century. In 1101 the King of Cashel gave the Rock to the Church. What an unbelievable day! The sun is shining and there are a few puffy clouds in the sky. A very slight breeze is wafting around our heads. We headed out this morning on a bus tour our Dublin. We saw lots of sights and planned the walking trip we were going to take this afternoon after the tour. Two of the highlights were St.Patrick's Cathedral, or the National Cathedral and Collegiate Church of St.Patrick in Dublin, and Trinity College Library in Dublin. St.Patrick's Cathedral. This is the same view from the inside.Note all the stained glass windows. Sir Benjamin Lee Guiness (yes, the same) gave lots of money to the Cathedral including the purchase of the pipe organ with over 3000 pipes. At St.Patrick's, Jonathan Swift, author of Gulliver's Travels and other books, was Dean from 1713-45. Handel's Messiah received its first performance here in 1742. The Norans built a church in stone on this site in 1191. This was rebuilt in the early thirteenth century and is the bouilding we see today. A spire was added in 1749. One of the very colorful pages of the Book of Kells, here back lit to illustrate the great technical skill of the author. Two of the Georgian doors. Crowds of shoppers wander the streets. Street musicians practicing their talents are plentiful. At Trinity College The Book of Kells is on display. The Book was written over 1000 years ago by monastic Monks in communities devoted to the study of God's word. The Book of Kells contains lavishly decorated copy, in Latin, of the four gospels of the Bible. It has been associated with St. Colum Cille (521-597 AD) who founded his principal monastery on the island of Iona, off the west coast of Scotland in 561. The Book of Kells was probably produced early in the 9th century by the monks of Iona, who worked partially in Iona and at Kells, county Meath, where they moved after 806 A.D. when Iona was attacked by Vikings in a raid which left sixty eight monks dead. The Book was sent to Dublin in 1653 for security. It came to Trinity College in 1661. After the visit to Trinity College, a number of the group wandered up and down the streets in the downtown area taking in the sights. In the area the Georgian houses boast some of the most photographed doors in the world. Tonight was a wonderful Irish House Party. We all tripped over to a pub and had a delicious family style Irish dinner. The tradition of the House Party is that the Irish were so poor that they couldn't afford to bring a bottle of wine or another type of gift, so they brought their talent. Each guest was expected to share something they can do...sing, dance, recite poetry tell a story or even play an instrument. Tonight Ken Haverland recited a cowboy poem, Audrey Steven sang the beautiful Wild Irish Rose and Angela Chen sang a moving and beautifully done song about a young girl who was waiting for a boy to recognize her so they could go out together. Scott Gorby even volunteered to dance. Well done, everyone. This sign welcomed us to the Irish House Party. Guests sat a long tables and enjoyed an Irish meal. The band was made up of a guitar, Irish pipes, an accordian and dancer. Tomorrow is Sunday and we leave on the bus at 7 am back to Wales. We catch the ferry at 8 am and sail 3 hours to our next destination.That's it for now. Greetings from Wales! What a day! Up at 6 am, bags out, breakfast and on the bus by 7 am. After a wonderful nite of The Irish House Party, most everyone was blury eyed and groggy. But we made it on time. Most of the time was taken with a ferry ride from Ireland to Wales. That was a 4 hour trip and most everyone was taking a little zizz (nap) on any flat surface they could find. Was a very quiet ride. The day was absoulutely beautiful. Our tour company, Collette Vacations and our Director, Peter, really has this trip planned well. They even brought us the good weather. Once we landed, our trip was mostly a ride through the beautiful countryside. We passed over the highest mountain in Wales, the Snowden Pass at 3100 feet. Beautiful. On the way we made a couple of stops. Arriving at the port of Dublin, we boarded the ferry for the 4 hr.ride to Wales. Here is the last sight of land from Dublin. One of the first old buildings we spotted as we landed in Wales. If you can see the name of this town, with the longest name in the world, you are doing well. A visit to Caernarfon, a walled city built in the 11 century was never finished. The Caernarfon Castle, note the polygonal towers. It was the state of the art in castle building. The castle is located on the banks of the River Seiont. This is the first glimps of the landing in Wales. Some very old buildings were seen as we landed in Wales. Our travels through the Snowden Pass gave us these scenes of the beautiful rock walls that were prevelant all over the countryside. Our hotel in Ewloe, Wales We were even greeted by this beautiful rainbow. One was at the castle at Caernarfon. This walled castle protected the towns people from invaders. Prince Charles was crowned here in 1969. King John signed the Magna Carta here in 1066. Another stop for lunch was at a little town in Wales with the longest name in the world. If I had been thinking I could have written it down, but you can look at the picture above and decern the name as it appears here. Tomorrow we are off to Edinbugh, Scottland for some wonderful sights. We will catch up with you then. Today has been a day of go from here to there as fast as possible. A great day, too. We left our hotel this morning at 8:30. We headed North up through Wales to England then into Scotland. Our first stop was a rest stop at a “Lancaster Service” truck stop for coffee and rest break. From there we drove through the rolling hills of Scotland. It is on the peninsula that juts into the Irish Sea. What a beautiful ride. This area get over 60 inches of rain a year so everything is so green. We passed some areas that are considered National Parks. Here they are called A.O.N.B.’s or Area Of Natural Beauty. We passed through the Lake District. It is made up of many lakes carved out of the mountains by glacial activity thousands of years ago. It was settled between the 16th and 17th century and is a UNESCO National Park. Artists have found the area to very inspirational. People such as William Wordsworth, the poet, lived in the area. He is now buried in a local church in the town of Grasmere. He and some of his friends shunned the start of the Industrial Revolution. That proved to be an important stand, which left the area covered with trees that would have been used for fuel to run the new industrial plants. Now the area is filled with trees and some beautiful, hand made walls of stone that separate pastures. Beautiful rolling hills of Lake District The town of Grasmere Church yard where William Wordsworth is buried. Old tractor at the Gretna Green Chapel grounds. Buggies in the Gretna Green museum Map of area around Edinburgh. Our last stop before our destination of Edinburgh, Scotland was the town of Gretna Green. This area is famous for the Marrying Blacksmiths. During the 17th and 18th century England banned the practice of people getting married too early. The law said that a person had to be 21 to be married or have their parent’s permission to get married. In Scotland there were no age limits or laws that said one had to be married in a church or by a qualified person. So people flocked to the first place they could go to get married. That place was Gretna Green in Scotland. The Blacksmiths in the area were available to marry people of any age. They used the metaphor of the forge and anvil to melt people, as they did with steel, together in marriage. We will be here in Edinburgh all day Tuesday visiting places including the Edinburgh Castle, St. Giles Cathedral, the Royal Mile, Palace of Holyroodhouse. We will be checking back with you tomorrow evening. Greetings from Edinburgh. Today started a bit late, 9 am, with a bus tour around the city. We saw the old town, over 1000 years old, and the new town, built in the 18th century to relieve the unbelievable overcrowding of the old city. At the end of the tour we were let off at the Edinburgh Castle to walk through and admire the sights. And what sights there were. The castle is situated on an old volcano, so it sits very high above the city. One of the pictures shows the panorama that can be seen from the West wall of the castle. During the afternoon we were able to visit the area below the Castle. Included in our visit was the St. Giles Cathedral. The church has been a place of worship for over 1000 years. It takes its name from a renowned medieval saint who performed many miracles. The impressive Gothic interior houses many historical monuments and memorials including the Chapel of the Most Ancient and Most Noble Order or the Thistle, the tombs of Argyll and Montrose, and a memorial to Robert Louis Stevenson. This church witnessed the many life changing events-the Reformation of the Scottish church in 1560, the fiery sermons of John Knox, the Jenny Geddes riot and the happenings and doings of a whole procession of saints and sinners. Down the street from St. Giles is the oldest house in Edinburgh, now a clothing store. Right next to that store is the home of John Knox. This was taken as we entered Edinburgh. The front door of the house Robert Luis Stevenson lived in around 1850 This Palace of Holyroodhouse was spared distruction and is where Queen Elizabeth comes to visit in July each year. Palace of Holyroodhouse Chapel of Holyroodhouse, once a Catholic Monestary was distroyed when Scotland became a Protestant country. These walls are of the Edinburgh Castle. Note the cannons at the top of the picture. This is an amazing panorama of the City of Edinburgh seen from the top of the Castle. Down the street from the Castle is St. Giles Cathedral. Grave of Jean Thompson, wife of Paul Harris, founder of Rotary. Loren presents Westminster 7:10 banner to the President of the Haddington Rotary Club, Alan Skutecki. Note the President's Chain of Office around his neck. Beautiful. It contains all the previous President's names on small gold plaques attached to the ribbon. The buildings are made of sandstone and up until the 1950’s these homes were heated with coal. Every room had a fireplace, so each home has 4 or 5 chimneys that spewed black smoke from the coal fires used for heat. The sandstone absorbed the soot from the fires and turned black. People now spend thousands of pounds to clean the outside of the buildings to bring them back to their original luster. We spent the afternoon wandering the streets looking in stores and enjoying the crowds of people. After we returned to our hotel and a little rest, we headed out for a Rotary meeting about 30 minutes out in the country. The Haddington Rotary Club, about 29 members strong, had invited four other clubs to join them for a presentation from a District Governor from India who presented a program about all the projects his club was doing. About 30 of our tour members also joined in the dinner meeting. On the way to the meeting we stopped at the grave site of Jean Thompson, wife of the Rotary founder, Paul Harris. She was born in Edinburgh, so after Paul’s death, came back to live with her family. What a great visit we had with all those Rotarians. The evening came to an end and we are now back in our hotel getting ready to repack the suitcases and leave at 8 in the morning for York, England. As an aside to this mistle, we have to buy time on the internet to publish this blog. All through Ireland and Wales, the hotels provided free internet access, just as hotels do in the U.S. Not here, though. We are paying 5 Pound (about US $8) for 90 minutes of time. This will continue throughout England as well. Have a great day. We'll be back on line tomorrow. Ah! Finally the rain. It is coming down in buckets. The whole trip has been a dream with some beautiful weather. Almost a week and a half with sun and light breezes. Now it is pouring. The wind is blowing and it is miserable out. We left Edinburg at 8 a.m. this morning. Our destination was York, England by 2 p.m. There was a rest stop about 10. We continued on with a quick lunch stop at a truck service area. The rain continued to fall. We were on a major link between Edinburgh and York, but it was only a two-lane road that was very winding. What a ride. We took a picture stop and the border of England and Scotland for 10 minutes then continued on to York. View of Edinburgh Castle from our hotel window. View of park across the street from our hotel. Construction of light rail in front of our hotel. Rock signifies the boarder between England and Scotland Front of York Minster (church) in York, England Inside view of same window. Pipes for the pipe organ at York Minster. Note the designs on the organ pipes. More organ pipes. These must be at least 30 feet high and 2 feet in diameter. In York we had the opportunity to take a walking tour of some of the sights. The main attraction was the York Minster (Church). What a beautiful place. So much history to learn about. The church was started about 1200 AD. It is in Middle Ages Gothic. We learned that because of the extensive use of stained glass, the roof had to be made of wood and lined with lead so the walls wouldn’t collapse. Other cathedrals usually used stone for the roof. There was also a new feature being used, and those were flying buttresses. These took some of the weight off the walls as well. There is more stained glass in this church than any in England. It was installed in the 14th century. Nearby the The York Minster was a local area called the Shambles. This is an English word derived from a word the Vikings used. This area was used as a butcher shop. It was the meat cutting district. All the butchers would throw the animal entrails out on the street. Can you imagine the stench! The Viking word was used to describe the mess, hence, everything was in shambles. After the walking tour we sat down at a local tea house called Betty’s Tea Room for a spot of tea and a fruit tart. The place was immaculate, the service second to none, and the desserts were scrumptious. What a great way to end an afternoon of walking. Now it is after dinner at the Marriot Hotel and we are getting ready to cash it in. Tomorrow is our last day of the trip. We leave for Birmingham at 8 a.m. We’ll check in with you tomorrow evening. Have a great day. Up and out by 8 a.m. Left for Coventry, a hundred miles to the South. On the way we passed the city of Sheffield, know for its fine steel knives. At 10 a.m. we stopped for a few minutes at a service stop for a Tea and Pee. More than you needed to know. On, then to Coventry. The name Coventry was given to the city by William the Conqueror in 1066 A.D. He did a census and recorded everything about the city in the Doomsday Book. He was going to record everything that happened until the doomsday happened. The name of the city was named for a Convent with a large Oak tree next to it, hence, Coventry (or Convent+tree). The Earl of Coventry raised the taxes extremely high. His wife asked him to lower the taxes at least three times. He finally made a deal with her: ride thru the town on a horse, naked, and he would lower the taxes. He never thought she would do it. The town’s people promised not to look when she rode by. However, when Lady Godiva rode by in 1034, a man by the name of Thomas did look and that is why we now have the name Peeping Tom. Coventry was an industrial center. Sewing machines, automobiles, ammunition and weapons were manufactured. An Army vehicle called the GP (General Purpose) was the precursor to the present day Jeep. On November 14th, 1940, the Germans destroyed the city by bombing the city all night long. They dropped 40,000 incendiary bombs an 400 tons of regular bombs. 700 lives were lost in that raid. The term “to conventrate” was used to describe major destruction. Hitler developed the “Bataker Raids” to destroy the natural treasures at St. Michaels Cathedral in order to lower the moral of the citizens of Coventry. The Allied retaliation to the destruction of Coventry was the total destruction of Dresden, Germany. However, before the bombing of Coventry the Allies had broken the German code used for communication. Winston Churchill knew the raids on Coventry were coming, but, rather than give up the secret that the Allies had the German code, made the decision not to warn or defend the citizens of Coventry that the raids were going to take place. He later said that this was probably the most difficult decision he had to make anytime during the World War II. The city has been rebuilt with many new modern buildings. However, the Cathedral was destroyed except for the tower. Today there is a new Cathedral built right next to the old one. And as a symbol of peace, students from Dresden came to Coventry to help rebuild the city when the war was over. Likewise, students from Coventry went to Dresden to help them rebuild. Before the cathedral was rebuilt the citizens of Coventry worshiped in the burned out, roofless, cathedral through the 1950’s. This is all that is left of the old cathedral. Here is a view of the walls and some support foundations for the walls. Inside the new church. This is a giant tapistry depicting Christ. To each side of the sancturary are the organ pipes. What a magnificent instrument it must be. There are magnificent stained glass windows. These are two of those windows. Note the size of the people under the right window. This is front of the pub Garrick Inn where we had lunch. This is a view of Garrick Inn from across the street. This is looking into the entrance hallway just inside the front door. It's very low and narrow. Here is the home of William Shakespeare. We toured two buildings. This one had video of the life and times of Shakespeare. Talk about old buildings...this is the front of our hotel where we spent the last night of our tour of the British Isles. Basel Spence, an architect, and a product of the landing on the beaches of Normandy, won the contest to rebuild the cathedral in 1951. He was later Knighted for his work. From Coventry we continued on to the home of William Shakespeare, Stratford on Avon. The river Avon was built as part of a canal system in 1821. There are now modern barge homes that ply the river as vacation homes, just as we use the modern motor home. Shakespeare was born on April 23, 1564 and baptized on April 26, 1564. He grew up with his father and mother. His father worked as a glove maker and wool merchant. In his early years he fell in love with the theatre. At 18 he married Ann Hathaway who was 26 years old, which did not please his family. She was already 6 months pregnant with his child. She gave birth to Suzanne. Later she bore twins, Hamlet and Judeth. Hamlet later died at 11 years of age. Later he went to London for 8 years. He lived on the seedy side of London. It was a very bad place to live. He had numerous affairs with women and men. He worked hard in the theatre, however, and was very good at set design and, of course, writing. When his son died he went back to Avon and purchased a new home for his family called New Place. Eventually he became a member of the theatre group Lord Chamberlains Men. He built the Black Friars Theatre, which became the main venue in London because it had a roof. He could do plays anytime he wanted without the threat of bad weather. Shakespeare retired in Stratford in 1616. He died shortly after that. There is no record as to why he died, but he loved his liquor and may have died from an episode of binge drinking. We were fortunate to be able to stop for lunch in Stratford. We found a pub called Garrick Inn, named after one of the players, David Garrik, that Shakespeare used all the time in his plays. The building has been occupied since the early 1400’s. In 1594 a fire trapped a young man named Tom who still makes his presence known. This was our final day of the tour. Not much to report. We left Stratford -upon- Avon a 9 a.m. and traveled about two and half hours South to Birmingham. We were able to check into our hotel early, so we got settled before lunch. Very nice hotel. Well appointed. Fortunately we are very close to the National Exhibition Centre (NEC). So, after lunch we took a walk over to the convention center to register. This place is unbelievably big. We have been in some big convention centers but this one takes the cake. It is huge. So, walking around is really going to be a chore. We did get our registration papers and some tickets to a couple of venues we want to attend. After hobbling back to the hotel we took the afternoon off and just kicked back and relaxed until dinner. This place has a first class dining facility. Very classy. We chose the main dining room in which to have dinner. The staff was very attentive, and we had a delicious dinner. There was a piano player who was about 80 years old who beat out some tunes that were so loud we could not hear ourselves talk. Fortunately he started late into our dinner, so we were able to get conversation started before he began to play. We did mention this to the manager, so maybe tomorrow night will be a little more enjoyable. Since we have not been on any sight seeing excursions, we have not taken any picture. Tomorrow should be a bit different. We’ll be taking a ten-minute train ride downtown to see what’s there. We’ll share a few pictures with you when we check in tomorrow evening. That’s about all for now. It’s a little after 10 p.m. and time to lay this tired head on a pillow. Good night. More tomorrow. And we thought the NEC was big yesterday with a short visit to register. Today we had the opportunity to visit the NEC for a complete day. This place is big! The House of Friendship is probably as big as 4 football fields set two wide. Unbelievable. We wandered around to see the sights in the HOF. We visited the Guide Dog demonstration area and had a nice chat with the folks that provide guide dogs to blind and partially sighted people from all over Europe. This was an interesting exchange since my Mom and Dad had started the Guide Dogs for the Blind in 1940 in Los Gatos, Calif. They were very glad to hear of he early history of the Guide Dogs in the U.S. of A. Here is the very nice hotel we are guests of. It is the Arden Hotel named after the mother of William Shakespeare. This is the beautiful garden just outside our room window. Note the goldfish in the pond. Greeting us at the House of Friendship is this garden sculpture of the Rotary wheel. Near the entrance is this working carousel. As we wandered to find a coffee and a quick seat, there were musical bands and stage demonstrations taking place. People continued to arrive and the HOF began to fill with more and more people. By the time we left, there was very little standing room left. It seems as if most everyone has arrived although the official opening doesn’t take place until tomorrow morning. We took about an hour to sign up for the next conference in Montreal, Canada next year. Roberta, we are bringing information back so you can sign up as well. Put June 19-23 on your calendar. We will be looking for more that one person to go to this convention next year. This is the longest day of the year. It is 8:30 p.m. and the sun is still shining on the sides of the buildings. It will be light here until at least 10:30. Very strange. It keeps us up very late in the evening. This morning we headed out to the first Plenary session of the 100th Rotary Convention. What a stirring program. The theme was “East meets West”. The first program was a group from Korea that presented a very flowing fan dance. After that was a rousing brass band from the Queens Guard. A traditional presentation of flags from 154 countries was done. After this part of the program, Ed Futa, General Secretary of R.I. who was the Master of Ceremonies, gave a few words of welcome and introduced the Aide to RI President D.K. Lee, Mike Pinson of the Rotary Club of Killeen, Texas. He presented President Lee and also introduced his whole family including his new grandchild. President Lee then addressed the audience and told about the 27% reduction in infant mortality in the last 2 and half years after he was selected to become President of R.I.
After President Lee’s speech the program proceeded with more entertainment. Included was a wonderfully colorful drum dance that raised the roof. A group of kids from Korea called the Little Angels did a wonderful job of singing both in Korean and English. The Queens Guard performed again and finished out the morning with some grand marching music. A Birmingham welcome at the train station. Isn't this a bueatiful sight? Note the sign above Burger King. Barb chats with a Rotarian over a breakfast buffet at the hotel. The LG Arena getting ready for the opening Plenary session. This is a huge hall. The Little Angels from Korea sing. The flag of the United States is paraded during the flag ceremony. The Rotary flag which unites us all is brought in and placed. RI President Lee is seen on the jumbotron speaking to the gathered throngs. The Queens Band plays some stirring marches. The Korean Drum and dance group wow the crowd. The arena was completely full this morning and when the throngs were dismissed they all headed to the House of Friendship. When Barb and I finally got over there the lunch lines were unbelievable long and yet we were able to meet some Rotarians from different parts of the world as we waited our turn for lunch. We then spent part of the afternoon visiting booths and listening to the entertainment which was continuous on two stages in the hall. On one stage there was a brass band that played for about an hour. One the other, when the band wasn’t playing, were different groups and individuals that played and sang to the gathered crowd. It was a crowded venue, but very well organized and the Rotarians were well disciplined. 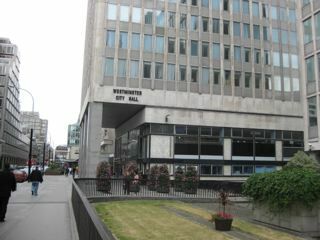 We then decided to take the train into Birmingham to see a few of the sights and do a little shopping. The train ride was about 10 minutes into the city. We arrived about 4:45 pm and left the train station to walk across the plaza to do a little shopping. Upon arrival to the shops we were told that all the stores were closing at 5 p.m. due to the “blue laws” for Sunday shopping. We walked around a couple of streets and visited the oldest church in the city, St. Martins Church. It was reported to have been used as a place of worship in the 12th century. The tower and spire date back to 1781. After looking around a bit we stopped and had a delicious Italian meal at a street side restaurant. Very good food and reasonably priced as well. As you know, for every English Pound we spend we are actually spending about $1.75 in US dollars. We just don’t think about that. We’ve just returned to our hotel and are kicking back and doing a little reading and writing. Have a great rest of the day. We’ll check back tomorrow. What a busy Convention! We have been going from 6 am to midnight the past two days, hence, the big gap in correspondence. My apologies. I’ll try to capsulate the last couple of day so as to not make this too long. We last left you on Sunday. Since then we have enjoyed the 2nd Plenary session of the Conference which started with Ed Futa, General Secretary, who presided as Master of Ceremonies. We were entertained before the session started by the The Kenny Academy of Irish Dance. What an energetic group; a very rousing performance. The theme of the day was “Growth of Rotary”. We heard from Clarissa Brocklehurst, Chief Water, Sanitation and Hygiene for UNICEF. Not to sound too snobbish she described her organization as Taps, Toilets and Soap. She described everything UNICEF and Rotary are doing together in the world. Very impressive. There were then introduction of Past Rotary Presidents. After that Tom Henderson, Founder of Shelter gave a wonderful presentation about ShelterBox and what it is doing to help people around the world. He spoke with no notes and gave a wonderful talk. We then were introduced to the Rotary Board of Directors. At the end of the Plenary at 11:30 we walked over to the House of Friendship where lunch was in order. There is an amazing about of food around here. Everything from tea sandwiches to English Pasties (turnovers) to chicken skewers are available . There are coffee kiosks all over the hall. No one has go hungry here. This evening we signed up for Host Hospitality Night. A club from Stratford upon Avon picked up about 40 Rotarians and took us to their venue which turned out to be the school where William Shakespeare was educated. The bus made a wrong turn and it took us an hour to make a 30 minute trip. We had a wonderful homemade buffet supper. The Master of Ceremonies gave a very informative talk about the school which was founded in 1515. The schoolmaster taught all the boys (no girls allowed) in Latin because that is how you could get into university and get the jobs that were of any importance. Shakespeare’s father, John, who made stylish gloves for the very well to do, was Mayor of Strafford so he could send his son to the school for free. Later John’s business failed and William was kicked out of school. The students started school at the age of 5 or 6 years of age. The students then left school at the age of 14 to go on to university. The school day started at 6 a.m. with a visit to the chapel for prayer and ended at 5 p.m., 6 days a week. The kids had to bring their own food and started the day with breakfast of bread, and because the water was so bad, had to drink light ale as a beverage. Lunch was from 11-1, so they could run home and get something there. They left at 5 pm with stacks of homework. The students practiced their Latin in the room below the classroom performing plays, all in Latin. This is where William was smitten with writing and performing plays. When William got back from London some years later, he paid 60 Pound Sterling for a new home for his family. He had made a fortune in London over the years and could afford to provide a nice home for his family. We finally ended the evening with a couple of toasts to the host and to the Club for showing us such a wonderful evening. The bus returned us to the hotel about 11:30 p.m. Yawn. But, a great time was had by all. Tuesday saw the opening Plenary session as “The Rotary Foundation” theme. Master of Ceremonies Ed Futa presented the Plenary report. He said there were 33,641 clubs in Rotary International. There are 3,752 clubs represented at this Convention, there are 1,744 delegates here which represent 4,024 votes, and there are 155 delegates at large here. This total represents 4, 179 votes. Past President Jonathan Majiyagbe addressed the session with an award of the 2008-9 Global Alumni Service to Humanity to Dr. Alex Buchanan for his work in developing nutritious, high protein biscuits for those in need of food. Mia Farrow was the keynote speaker this morning. She has starred in over 40 movies. She is the mother of 14 children (10 of whom are adopted). She is a UNICEF goodwill ambassador and has worked extensively to draw attention to the genocide in Darfur and the fight to eradicate polio, which she survived as a child. We attended a workshop at 1:30 that addressed newsletter issues for local clubs. We talked about how the web could enhance our printed and online newsletter. There were some good discussions about how to use the Rotary logo and then we discussed many different web sites that could be used for publishing online newsletters and club web sites. Turns out that the service we use (Club Wizard) is one of the top programs that small clubs use. Tuesday evening was a concert by the Treorchy (tray-orky) Male Choir from Wales. It was held in the Town Center, a concert hall in downtown Birmingham. This was a concert of concerts, an unbelievable performance with a number of soloists, a pipe organ that also did some solo work. It was one of the best choirs we have heard. This was a late night out. We were back at our hotel by 11:30. Today, Wednesday is our final day. The Plenary session began at 9:30 with the Master of Ceremonies, Ed Futa, introducing RI President, DK Lee, who presided over the election of officers and President-nominee for the 2010-11 Rotary year. My duties as the official delegate to the convention was to cast two affirmative votes that lead to the unanimous ballots for both the board members and the President-elect Ray Klinginsmith from Kirksville, Missouri. No other issues came before the delegates. The speakers we heard this morning were Dr. Jane Goodall, who told us that the way we are living is not sustainable. We need to reduce greenhouse gasses and conserve more. Dr. Goodall has worked all her life in Africa studying chimpanzees. She established the Jane Goodall Institute for Wildlife Research, Education, and Conservation. After the morning session we adjourned to the House of Friendship where we grabbed a little lunch then spent the afternoon enjoying the music on the two stages and visiting booths and doing a little shopping. Tom Henderson from ShelterBpx stands on a stage before 14,000 Rotarians and explains what ShelterBox does. Some of the attendees walking from the Plenary session to the House of Friendship Barb Donaldson and Linda Brown enjoy a little lunch on an outing into Birmingham. Top: Canals in Birmingham. There are more miles of canals here than in Venice. William Shakespeare's School House. His school was on the right top floor of this building. Below is the Treorchy all male choir. Top: A view of the magnificant organ in the Town Center concert hall. Top: A view of the audience at the Choir concert. Bottom: Irish dancers entertain the crowd at the Plenary session. Top: District 5450 e-club one is prominate at the House of Friendship. Bottom: Tom Henderson of ShelterBox is introduced to the delegates. The closing ceremonies began at 4:30. We recognized the Convention and Host committees and Sergeants-at-Arms. We heard the RI President-elect John Kenny’s address. His theme is “The Future of Rotary is in Your Hands”. The emphasis points are Water, Literacy, Health and Hunger. The Strategic Plan adopted by the RI Board includes Service, Fellowship, Diversity, Integrity, and Leadership. We “must and we will finish Polio eradication” It is our obligation to society. So far we have immunized more than 2 billion children and have reduced the number of countries with polio from 125 to 4. At 6:30 pm the session ended and 14,000 people streamed out of the LG Arena to the waiting busses to return everyone to their hotels. What a sight! This ends the musings of one tired Rotarian. We will be leaving our hotel at 7 am Thursday morning to catch a bus that will take us to London. This will be about a 3 hour ride. From there we catch a non-stop United flight directly to Denver and will arrive at about 4 pm Denver time. I must say this has been an absolutely wonderful trip. We met so many great Rotarians and saw so many historic and interesting places. We have already signed up to attend the next Rotary Convention in Montreal, Canada. It will be held June 20-24th, 2010, and I expect to see more than one Rotarian from Westminster 7:10 sign up and attend. This conference gives one a perspective of Rotary not found anywhere else. It is an exciting and amazing event. Give it a shot. You can sign up on line from our web site: www.westminster710rotary.org Go to the Rotary.org link. See you at our next Rotary meeting.